In the two years since Facebook acquired Oculus for $2 billion, it’s been difficult to predict how Mark Zuckerberg’s plan for integrating virtual reality into the social network would actually work. But at the F8 developer conference yesterday, CTO Mike Schroepfer showed how the Rift will allow Facebook users to interact with each other in virtual space. In the demo, Schroepfer donned an Oculus Rift headset, which he used to communicate with Michael Booth - part of Facebook’s Social VR team - who was based some 30 miles away at the company’s headquarters, in Menlo Park. With both men wearing Rifts and using the controllers, they were represented in the virtual landscape as floating heads and hands. These avatars could be customized using virtual pens to add beards and other features. After drawing and manipulating some objects in virtual reality, Booth “picked up” a 360 photo that was represented as a handheld sphere and threw it at Schroepfer, teleporting them both into the image. Once inside, the pair were able to look around with the same kind of immersion provided by all 360-degree VR photos, and were still able to interact with virtual objects. 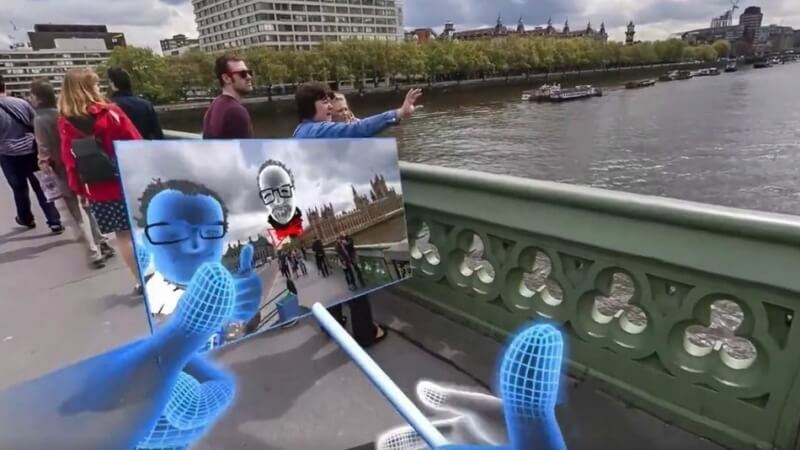 The biggest talking point came when they picked up a virtual selfie stick and took a virtual selfie, which was then posted to a news feed using what looked like some kind of teleportation box. These virtual environments aren’t limited to one or two users at a time; Oculus says it’s been able to get five people inside them at once. The technology in the demo is something the company is still working on, and it will likely be quite a while before it’s implemented (and enough people own VR headsets to make it worthwhile), but it does give us an idea of Facebook's virtual reality future. "Imagine a social experience in VR that's indistinguishable from real life," said Yaser Sheikh, a researcher for Oculus. "Where the tech disappears and you're just interacting with another person."